At the foot of the Vercors mountains, with easy access to the Valence-Grenoble motorway, Sue and Dominique will give you a warm, friendly welcome. 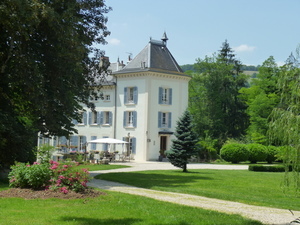 Our 19th century chateau, in extensive grounds with mature trees and a number of ponds, is ideal for discovering the little-known, spectacular area of the Vercors on foot, by bike or by car, and boasts a beautiful river to relax by at the end of your outings. Lock-up garage for bikes and motorbikes. Breakfast is served on the terrace if the weather is fine, and if it's cool there's a fireplace for you to curl up by. We also offer our table d'hôte from time to time. If you need to keep in touch with people, we have WiFi at your disposal. 4 tastefully-decorated bedrooms, all with en-suite bath or shower, all with views of the grounds. Breakfast (with home-made jams and pastries) on the balcony or patio (weather permitting). We will do our very best to ensure an enjoyable stay, and will be pleased to advise you on places to visit, walks, etc. The Vercors is a paradise for cyclists, mountain-bikers and hill-walkers, with many trails of varying difficulty,, and you will find a lock-up garage for your bikes. For the less sporty, there are spectacular mountain roads, caves (the magical 'Grottes de Choranche'), villages such as Pont en Royans. And for those with an interest in history, the Museum and Memorial of the Resistance. On the A49 Valence-Grenoble motorway, coming from Valence, take exit 8 (Baume d'Hostun) direction St Nazaire en Royans, thenSt Jean en Royans. Coming from Grenoble, take exit 9 (St Marcellin), then direction St Jean en Royans. Just after St Thomas en Royans, turn left for St Laurent en Royans. 1.5 km after that, you'll see the le château on your right. Drive on to the roundabout (Renault garage), then back to the lane leading down to the chateau. If you're coming from the North of France or from Belgium, why not consider the train+car rental? Valence TGV station is only 30 minutes away!